2. 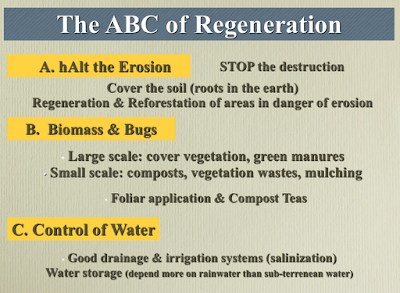 How can we Regenerate Soils? "Deserts are the footprint of civilization", & this means that the most important work we have to do now as conscious human beings is to regenerate the soils that have been lost, & those that have been exploited & de-vitalized all over the planet, especially by agricultural activities. Fertile soils are very important stores of carbon in the earth, & just with regenerating soils we could halt climate change stabilizing the concentration of CO2 in the atmosphere. It is vital for sustainability that we regenerate & improve the fertility of soils also because they are the support of biodiversity, important stores of water & indeed the base of all land-dwelling life & any civilization. There are many techniques we can use, & many very inspiring examples of soils regeneration (& so of entire ecosystems) in the world. In this class we explore several of those. What If A Solution To Climate Change Was Beneath Your Feet? Soil is a living universe beneath our feet. As important to our lives as clean air and water, soil also holds a potential solution to the global climate crisis. Increasing numbers of scientists, farmers and ranchers are implementing innovative land use practices that build fertile soil and sequester atmospheric carbon These methods of land management have the potential to provide us with nutritious food, improved human health, cleaner water, and a healthier planet for all. World wide, most soils are depleted of carbon. The atmosphere contains an excess of carbon in the form of CO2, a climate change causing gas. What if that CO2 could be removed and stored in our carbon-hungry soil through land management practices? Find out how in The Soil Solution. The Soil Solution to Climate Change was one of thirteen films featured in A Climate of Change Tour sponsored by 350.org, TRUST campaign and Wild and Scenic Film Festival. It has screened at the Santa Barbara International Film Festival, Sausalito Film Festival, Awareness Festival, Davis Film Festival, Wild and Scenic Film Tour 2013 and the One Earth Film Festival. Anything that we do to increase soil fertility could be a step in reversing climate change. What Goes Up Must Come Down!- Cover bare soil with plants! Fertile soil is a natural sink for atmospheric carbon; the very same carbon that contributes to climate change. Excess carbon can be pulled out of the atmosphere by photosynthesis and into plants and the soil where it can have a beneficial effect. Support Farmers and Ranchers Who Treat The Soil Like Gold- Buy from local food producers who increase soil fertility by using climate friendly agricultural methods including no or low-till plowing, cover cropping, composting and organic farming. If you eat meat, buy grass-fed beef from ranchers who practice holistic or rotational grazing methods that mimic the natural patterns found in nature. If You Grow Your Own Food, Grow Your Own Soil- If you grow food, take care of your soil. Increase soil fertility by avoiding the use of toxic synthetic pesticides, fertilizers and herbicides on your garden or lawn. These poisons kill microorganisms that reside in and on the soil. These organisms perform numerous ecosystem services; including providing nutrients for plants, creating soil humus and loam and increasing plant health. The soil is filled with billions of unemployed microorganisms ready and willing to take on the job of providing nutrients to plants and indirectly to you. Increase Your Skill Set- If you feel hopeless about climate change- it’s time to take action. Learn how to grow food without increasing atmospheric CO2. Take a course in organic gardening or regenerative farming. If you work with animals, learn about the benefits of rotational grazing. Get to know your local soil microbes and the Soil Food Web.